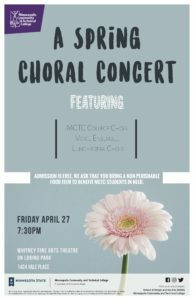 Minneapolis Community and Technical College will present a Spring Choral Concert featuring the MCTC Concert Choir and Vocal Ensemble Friday April 27th at 7:30 pm in the Whitney Fine Arts Theater, 1424 Yale Place, on the MCTC campus in downtown Minneapolis. The concert, directed by Dr. Elizabeth Pauly and accompanied by Christopher Wolter will feature the choirs’ characteristic blend of European art music with folk and traditional music from across the globe. Pieces include compositions and arrangements by Eric Whitacre, Jocelyn Hagen and Antonio Carlos Jobim. Joining the choirs will be guest artists percussionist Joel Arpin and flutist Julie Johnson. A reception in the Fine Arts lobby will follow immediately after the concert. Light refreshments will be served. Children are welcome. 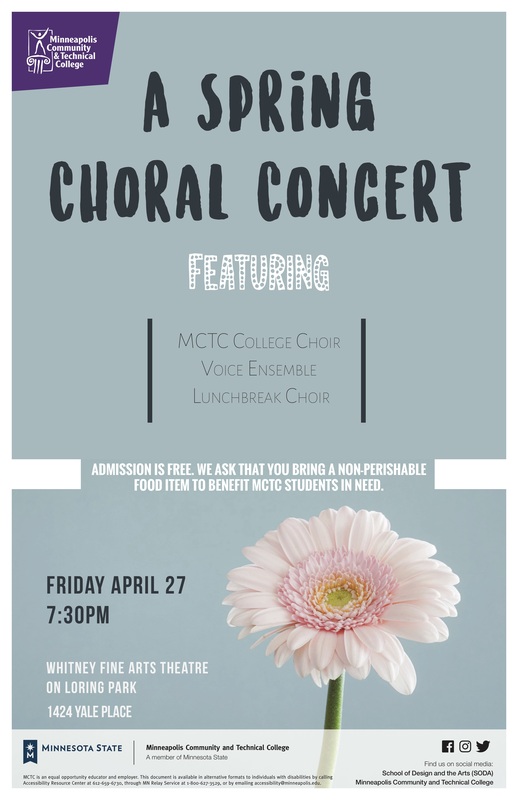 Admission to this concert is free, but the choirs ask that you bring a non-perishable food item, which will benefit MCTC students in need.